NO GAMEBOARD needed for this year’s Tops Markets Monopoly Game. 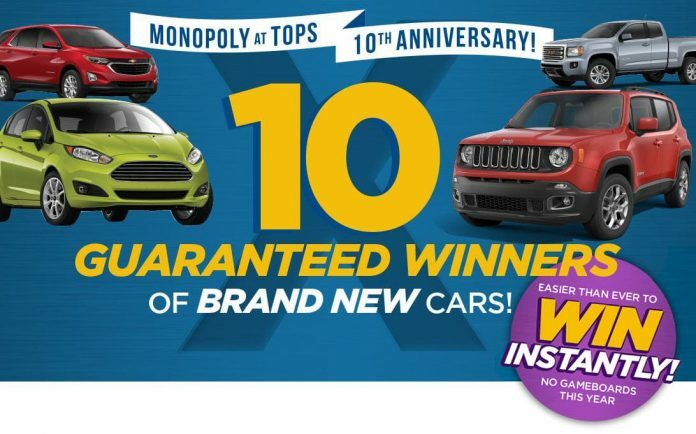 Just shop, rip and win cars, cash, food, and over 3 MILLION instant win prizes starting March 17, 2019. Be sure to look for bonus ticket tags on more than 2,000 items throughout the stores. You’ll receive 1 bonus game ticket at checkout for every specially marked product you purchase like Pepsi 2 Liters, TOPS Cereal, TOPS Peanut Butter, Smithfield Foods Stack Pack Bacon, Pringles, Pop-Tarts and more. The Tops Markets Monopoly Game 2019 is open only to legal residents of New York, Pennsylvania and Vermont, ages 18 and over. The game runs from March 17, 2019 through June 8, 2019 (12 weeks), or when all game tickets have been distributed. The Monopoly Game is being conducted in 163 participating TOPS Stores being operated as a “TOPS Friendly Market” by TOPS and/or its affiliates or franchisees in New York, Pennsylvania and Vermont (excluding TOPS fuel stations, convenience stores, including TOPS Xpress and TOPS Fresh Xpress locations, and in-store Tim Horton’s franchise locations).